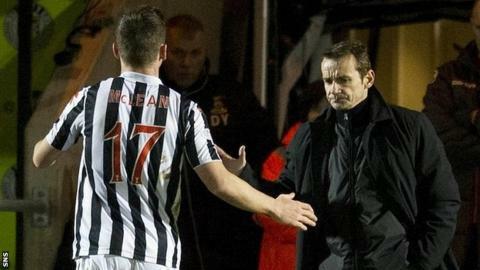 Danny Lennon was delighted his St Mirren side were able to follow up their League Cup semi-final by beating league opponents Inverness. And the manager hopes the Buddies can complete a memorable week when they host St Johnstone in the Scottish Cup on Saturday. "To go and beat the top two teams in Scotland [Celtic and Inverness], it's absolutely fantastic," Lennon said. "It's been a great week for us, we want to go and finish that off." Goals from Esmael Goncalves and Steven Thompson, which sandwiched a Billy McKay penalty, gave St Mirren victory against the Highlanders. Lennon praised the performance of recent signings Goncalves and Conor Newton and said of the former: "There's a lot more to come from him. "The players picked up from where they left off on Sunday." The Buddies boss described Kenny McLean's return from injury as a "great plus" and hopes the midfielder will still be in his squad after the January transfer window closes. "I hope that window shuts quick," he added.